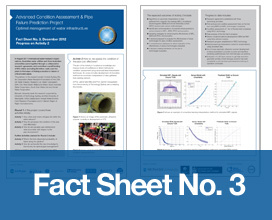 Fact Sheet No.3 – How do we assess the condition of the pipe cost effectively? Activity 2 How do we assess the condition of the pipe cost effectively? The aim of the Activity is to advance knowledge and improve levels of confidence of direct methods for condition assessment using advanced data interpretation techniques. Its scope includes development of innovative methods for automatic interpretation of data gathered from existing sensors. A/Prof. Jaime Valls Miro and Prof. Gamini Dissayanake from the University of Technology Sydney are co-leading this Activity.